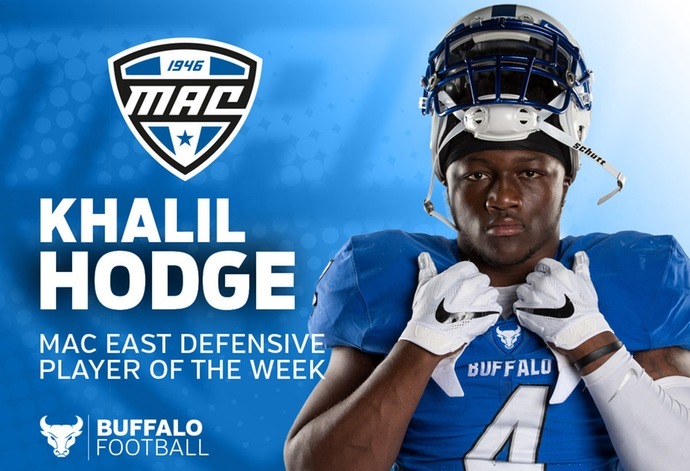 BUFFALO, N.Y. -- University at Buffalo linebacker Khalil Hodge was named the Mid-American Conference East Division Defensive Player of the Week, the league announced on Monday. It marked the fourth straight week the Bulls have had a player honored by the MAC. Hodge recorded a season-high 15 tackles and added a tackle for loss in Buffalo's 42-13 win over Rutgers on Saturday. The senior captain spearheaded a Buffalo defense that allowed the Scarlet Knights to score only one touchdown and amass 284 yards of total offense. Hodge had six solo tackles and assisted on nine others. He and the UB defense limited Rutgers to eight 3-and-outs in the game. Hodge leads the Bulls and ranks ninth in the nation with 47 tackles. He has 324 tackles for his career and became the fastest player in school history to reach 300 tackles. 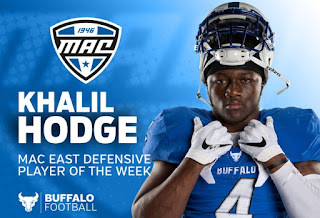 It is the third time Hodge has earned Player of the Week honors in his career. It is the fourth straight week a UB player has won MAC Player of the Week honors. Quarterback Tyree Jackson won offensive player of the week honors each of the first two weeks. Cornerback Cameron Lewis was named defensive player of the week after his two-interception performance against Temple. Wide Receiver K.J. Osborn was honored after his 188-yard, three-touchdown performance against Eastern Michigan. The 4-0 Bulls will host Army West Point at UB Stadium on Saturday at noon.